Dr. Bronner's Pure-Castile Liquid Soap - Peppermint 32oz. 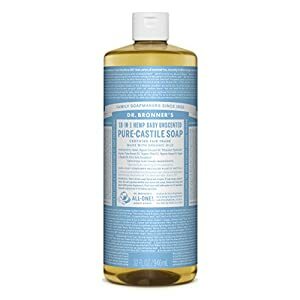 Dr. Bronner's Pure Castile Liquid Soap - Baby Unscented 32oz. Our most popular scent - with a peppermint burst so pure it tingles! Scented with organic peppermint oil to cool skin, clear sinuses and sharpen mind. Our Peppermint Pure-Castile Liquid Soap is concentrated, biodegradable, versatile and effective.Completely biodegradable and vegetable-based, our Castile Liquid Soaps have been called the "Swiss-army knife" of cleaning - usable for just about any cleaning task. These simple, ecologically formulated soaps are gentle enough for washing body, face or hair, but also powerful enough for tasks like dishwashing, mopping, laundry and even pest control.INGREDIENTS: Water, Organic Coconut Oil*, Potassium Hydroxide**, Organic Palm Kernel Oil*, Organic Olive Oil*, Mentha Arvensis, Organic Hemp Oil, Organic Jojoba Oil, Mentha Piperita, Citric Acid, Tocopherol *CERTIFIED FAIR TRADE INGREDIENTS ** None remains after saponifying oils into soap & glycerin. With no added fragrance and double the olive oil, our Baby Unscented Pure-Castile Liquid Soap is good for sensitive skin - babies too (though not tear-free! )Completely biodegradable and vegetable-based, our Castile Liquid Soaps have been called the "Swiss-army knife" of cleaning - usable for just about any cleaning task. These simple, ecologically formulated soaps are gentle enough for washing body, face or hair, but also powerful enough for tasks like dishwashing, mopping, laundry and even pest control.INGREDIENTS: Water, Organic Coconut Oil*, Potassium Hydroxide**, Organic Palm Kernel Oil*, Organic Olive Oil*, Organic Hemp Oil, Organic Jojoba Oil, Citric Acid, Tocopherol *CERTIFIED FAIR TRADE INGREDIENTS ** None remains after saponifying oils into soap & glycerin. Scented with pure lavender and lavandin oils to calm the mind and soothe the body! Dr. Bronner's Pure-Castile Lavender Liquid Soap is concentrated, biodegradable, versatile and effective.Completely biodegradable and vegetable-based, our Castile Liquid Soaps have been called the "Swiss-army knife" of cleaning - usable for just about any cleaning task. These simple, ecologically formulated soaps are gentle enough for washing body, face or hair, but also powerful enough for tasks like dishwashing, mopping, laundry and even pest control.INGREDIENTS: Water, Organic Coconut Oil*, Potassium Hydroxide**, Organic Palm Kernel Oil*, Organic Olive Oil*, Lavandin Extract, Organic Hemp Oil, Organic Jojoba Oil, Lavender Extract, Citric Acid, Tocopherol *CERTIFIED FAIR TRADE INGREDIENTS ** None remains after saponifying oils into soap & glycerin.